Foster carer Mollie Lloyd knows the new year will look very different to the last 45. This year she will celebrate her 70th birthday. She will also move to a new house in Wiltshire and will fly abroad for her first holiday. But all these events will happen without children – an experience she has not had since 1967. Ms Lloyd started her own family over four decades ago and, since then, not a month has gone by when children have not bounced around her Trowbridge home. For 45 years she has cared for almost 300 children, including four of her own, but following official retirement she is now home alone. “This is totally bizarre. Sometimes I find myself listening to children playing, but there’s no children around, it is just in my head,” she said. “I have got no solid plan. I am going to wait and see what comes but I think I will find myself quite busy. In fact being a foster parent took up more than half of her life, to now. “I feel I have been very privileged to be involved with so many children, all of whom are very young, and I have just loved every minute of it,” she said. Amongst the highs she lists helping create new families, placing children with adopting couples and remaining in contact with some of the children she once fostered. Ms Lloyd’s longest placement was for seven years and the shortest just two hours. But her saddest memory was a time when she lost a sick child whilst in her care. “I had one baby die that I had placed with me, so that was quite a traumatic time, but we came through that and went on to have lots more children,” she said. Ms Lloyd has had a maximum of four children in her care at any one time, ranging from babies to children up to 10-years-old. Her longest placement was for seven years and the shortest just two hours. “I had four children of my own so to have four children in placement felt no different to me, but the issues that the children bring with them are very different,” said Ms Lloyd. Her strengths are easy to recognise to the outsider but she struggles to find the words to praise her own qualities. “I suppose I find it quite difficult to talk about myself,” she added. “What I do I do quite naturally. I like to put order in children’s lives because they have come from such chaos. It is a role that has earned her high praise from Wiltshire Council which she has worked with since the 1980s. Gill Burtwell, fostering manager, said: “Mollie is a remarkable person and her commitment to fostering is outstanding. Ms Lloyd has also been involved in encouraging other people to foster. “However if you’re fostering you have to be prepared to let go,” she says. 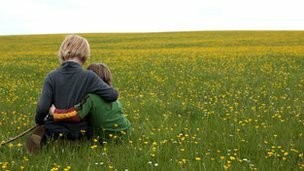 A strong attachment to each child is required but, as the foster carer, you have to be ready to take a step back and gradually let go of each child as they return to their own family, she explains. “It is an emotional time but usually for me, once I’ve met the prospective family, I am just excited and want to get on with it,” added Ms Lloyd. “I have met some amazing people and there are lots of children out there who want loving families. Contact us to apply to foster children.